Sweet potatoes bring to mind a crisp Thanksgiving evening spent gathered around the table with family, heaped under a fluffy cloud of marshmallows or baked into a steaming pie. However, when not starring as a side on the table, they are an important driver for research on specialty crops. The economic impact of sweet potatoes in the state of Mississippi grew exponentially in 2015. Sweet potatoes stretched across 21,500 acres of Mississippi fields and generated $81 million in value of production, up 19 percent from 2014. Despite the growth, sweet potatoes are still considered a minor crop and as such, fewer research dollars are allocated to sweet potato research. MSU researchers are hoping to change that. “Sweet potatoes are considered a minor-use crop by companies that provide crop protection services—meaning they are not one of the major large acreage crops like soybeans, corn, or cotton, which are more likely to receive funding for research due to the return on their investment,” explained Dr. Mark Shankle, Mississippi Agricultural and Forestry Experiment Station research professor in plant and soil sciences at the Pontotoc Ridge-Flatwoods Branch Experiment Station in Pontotoc. Scientists at the station are researching different management practices to determine the most efficient and effective way to produce sweet potatoes. “We are hoping to create a more efficient means of production. For instance, right now we’re trying to shorten the plant-back interval—or in other words, the amount of time you have to wait after a herbicide application before you can transplant sweet potatoes without injuring the crop. Sweet potatoes are lumped into the category ‘other crops’ on most labels, which typically means that a farmer must wait 18 months before transplanting sweet potatoes. 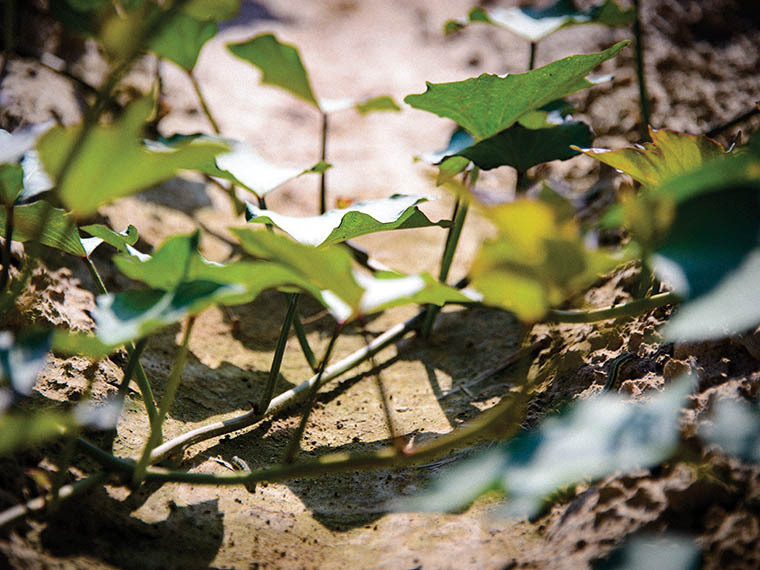 A lengthy plant-back interval will cause a farmer to lose out on the time they could have plants in the ground or prevent a herbicide from being available for use as a weed management tool. 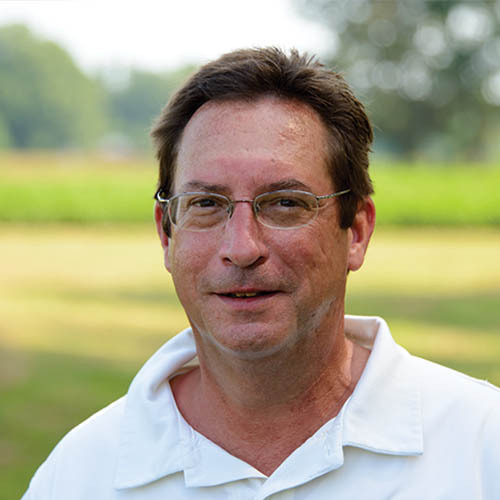 So we’re evaluating sweet potato tolerance to several herbicides with long plant-back intervals in order to determine the level of risk associated with using these products in weed management systems,” Shankle said. The Pontotoc Ridge-Flatwoods Branch Experiment Station is where most of Mississippi State’s sweet potato research is conducted. It is also the birthplace of the home-gardener-friendly Vardaman sweet potato and serves as a reservoir of virus-indexed sweet potato stock (plants that have tested negative for known sweet potato viruses) through the Foundation Seed Program. Unlike many vegetables, sweet potatoes are not grown from seed. Rather, they are cultivated using sprouts, or slips, from bedded sweet potato roots. 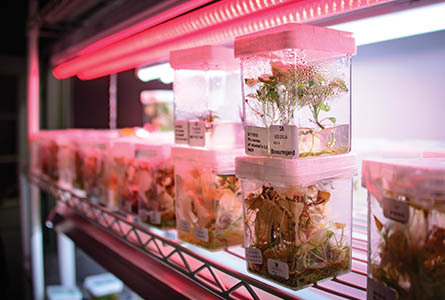 “We virus-index the plants and create clean tissue cultures. Then we take those to the greenhouse where we team up with a commercial partner who transplants the individual plants in the field, digs them up when they’re ready, and then sells the storage roots to be used as a clean seed stock for farmers to start their crop with the following year,” Shankle explained. Without clean stock, farmers may lose up to 20 percent of their crop to viruses—a hard hit considering the high price of sweet potato production, and in some parts of the planet, the losses can be even greater, with viruses wiping out an entire crop. The Pontotoc Ridge-Flatwoods Branch Experiment Station is one of six centers in the United States recognized as a Sweet Potato Clean Plant Center by the USDA National Clean Plant Network, a program dedicated to the health of vegetatively-propagated crops. “Recently, we also started producing virus-indexed heirloom varieties for home and niche growers. The goal is to eventually clean up everyone’s sweet potatoes. 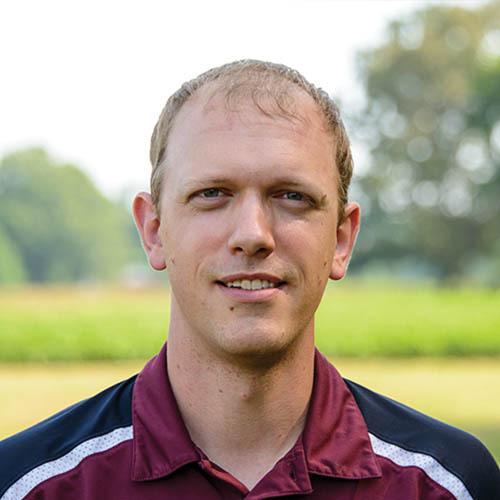 Providing heirloom varieties is a way for us to give back to the public as well as do some outreach about clean stock sources,” explained Dr. Stephen Meyers, assistant extension professor in plant and soil sciences. Much of the research done on sweet potatoes is generated by the needs of producers and stakeholders. “We try to let our industry stakeholders’ needs drive our research. They tell us their problems, and we try to address them. Our job is to serve our stakeholders in Mississippi and collaborate with colleagues in other states to address nationwide concerns,” Meyers said. Their drive to support stakeholders has even taken a creative turn in the form of the Mississippi Sweet Potato Innovation Challenge. The Mississippi Sweet Potato Innovation Challenge involves student teams creating useful, value-added products from the nearly 30 percent of the crop not suitable for the fresh market due to size, shape, color, or appearance. “One of the challenges our stakeholders had was trying to find value-added uses for unmarketable sweet potatoes, so we developed a program on campus through service-learning courses where students develop different products using sweet potatoes. This last year, they created deer attractants, personal care products like lip balms and soaps, and the coolest one—a microbial leather,” Meyers stated. The Mississippi Sweet Potato Challenge is sponsored by the MSU Extension Service, and the U.S. Department of Agriculture. With a host of young producers and a growing market, it’s an exciting time to conduct sweet potato research. “It’s a young industry, and having the chance to make a real impact by helping growers is incredibly exciting,” Shankle said. Want to get regular updates about similar research? Follow the Pontotoc Ridge-Flatwoods Experiment Station on Facebook @PontExpStation. Passion At Work: It is exciting for our team to work with sweet potato producers and other scientists to help our growers produce a quality product that is highly competitive. Passion At Work: I strive to help producers feed a growing population with the best quality products and with the least impact on local ecosystems, all while adhering to increasing regulations.